We offer natural, organic and specialty products to you and your online customers. We have over 20,000 items available online. We provide competitive prices, quick lead-time, regularly updated product images, data-feed and our most up-to-date inventory. Drop shippers welcomed. Direct Liquidation is the exclusive liquidator for many top US retailers and manufacturers. We carry millions of dollars in surplus inventory you can't find anywhere else. Over 100 categories of merchandise available by carton, pallet or LTL/FTL. Register free @ DirectLiquidation.com. 1-305-514-0587. We specialize in Closeouts, Overstocks, Liquidations, & Store Returns. NAME BRAND Health & Beauty products and General Merchandise at the LOWEST PRICES available. NEW Drug Store and CVS Shelf-Pulls arriving regularly. Call or email us for current specials. Licensed wholesale sports gifts. If you are a retailer in search of licensed NFL, NHL, NBA, MLB or NCAA sports merchandise, we have exactly what you are looking for. We also carry hot popular items like Disney's Frozen items. Jia Hua Trading, Inc is a leading wholesale supplier of Gifts, Toys, LED lights, Housewares, School Bags, Light Swords, Seasonal Products, Party Supplies and more. Contact us for the best wholesale pricing and service! We Dropship. We have both the tools and products to take your dropshipping business to a whole new level! With over 80k products spanning thousands of categories like electronics, computers, sporting goods, outdoor, home & garden and much more. Plus we have real time multi-channel inventory automation tools to help make selling online easy. Leading Wholesaler selling mainly HBA's, Office Supplies, and Food and Grocery. We also act as a super jobber to other wholesalers, exporters and distributors. DropShipProductSource.com-No minimum order requirements. Same day drop shipping on orders. Multiple drop ship product categories including Fountains, Garden gnomes, solar products, furniture, plus much more. Get a FREE webstore and FREE merchant account with our exclusive drop ship program. Pallet Fly is an innovative platform that is geared towards streamlining and optimizing the supply chain experience in product distribution. We offer pallets of every type of product including kitchenwares, cell phone accessories, toys, home decor, electronics, and more. We are wholesalers of tools, sporting goods, household and other general merchandise. We buy and sell imports and closeouts.SUMMER SPECIAL ALL ORDERS OF $750 OR MORE GET FREE FREIGHT!!!!!!!! 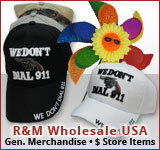 Large variety of merchandise at below wholesale prices. All of the pallets come with detailed manifests. In order to purchase merchandise from us you need to have a valid resale certificate. Flat shipping rate of $137.00. 98.5% manifest accuracy. processing fees.